This tour is designed for people who like to get out of the crazyness of the city and are interested in learning about other aspects of culture and nature, walking in small groups of people. The tour begins in Sturla Riverside Station in Puerto Madero, where we will meet at 9:45 AM. 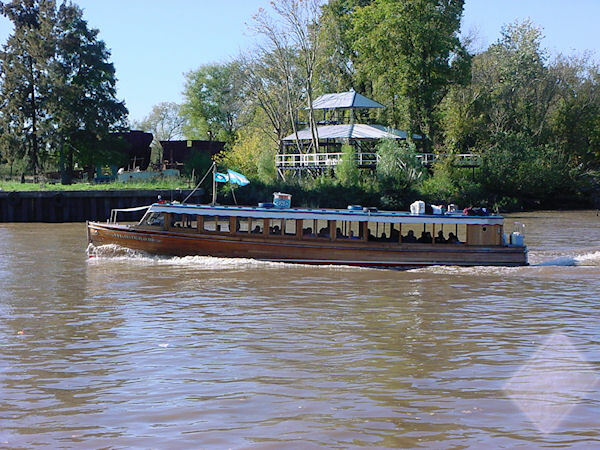 There we will embark the boat to navigate the Rio de la Plata and Parana Delta where we can see various attractions: Yacht Clubs, the Hills of San Isidro, Puerto de Olivos, University City and the football stadium of Club Atletico River Plate and others. The boat departs at 10:00 AM. Upon reaching our destination, we will tour the city of Tigre in the best way, in the touristic bus with guided audio, where we will go seightseeing around the city. We will make our first stop at the Puerto de Frutos market, old port for the landing of goods from Delta. Nowadays, it is a local tourist spot, visited all weekends by residents of Buenos Aires, as a way of recreation along the river. Here you will have free time to walk around the market, take pictures and take a quick lunch (not included). Later we will get again on the bus to Paseo Victoria, where we will have a walk and the opportunity to visit various museums: Museo del Mate, Naval Museum or Tigre and Art Museum (tickets not included). For our return, at 4:00 PM, we will embark on the boat again, where we will see the yacht clubs, the old house-museum of former President Sarmiento (who encouraged the first inhabitants to live there), market boats, taxi, ambulance, etc.. After leaving the delta, we will sail along the River Plate, the widest in the world, by the canal waterfront, parallel to the coast of the city. Our navigation and our tour ends in Puerto Madero, when the sun begins to hide from us, at 6:00 PM approx.